With names like Hunter and Target, destiny had to take hold some time. And next month, it will. Target's next big design partnership is with Hunter, a British maker of heritage-type clothing, accessories and outdoor wares. The company is best known for colorful rain boots worn by luminaries as diverse as the Queen of England to Kate Moss. Starting April 14, the two companies will offer more than 300 products online and in select stores in a limited-edition Hunter for Target collection. It's one of its largest design collaborations yet, Target says. Holders of its Red card will get first crack at the Hunter items, a full week ahead on April 7. The collection will have products for men, women, girls, boys and toddlers as well as home and outdoor products. Hunter is making its first hammocks for the collection as well as new sunshades and coolers. "Plus, the expertly designed iconic rain boots come in a variety of colors," Target said in a blog post this morning. Prices will range from $5 to $80 with most items under $30, the companies said. 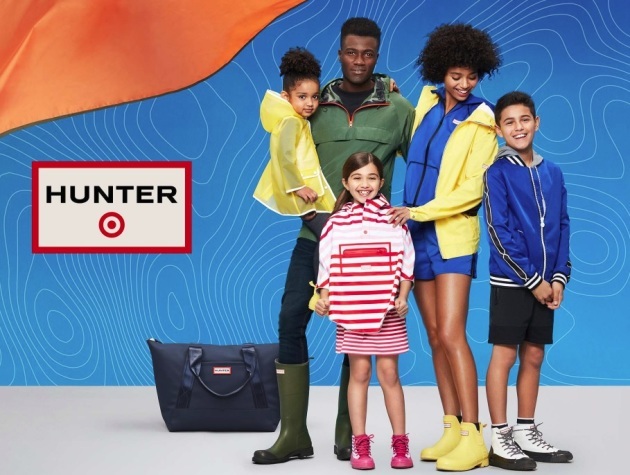 Prices of Hunter's iconic rain boots on its website range from $135 to $165, but all of the products for Target are new from Hunter and made specifically for the collection. About 800 of Target's more than 1,800 stores will carry the fast fashion line, including 23 in Minnesota, mostly in the Twin Cities area. Stores that will stock Hunter will be listed on Target's website at the end of March, but the entire line will also be available at Target.com. Target has done more than 175 special sales of products by big-name designers from around the world. Best Buy's Joly: When was the last time you bought a CD?